Dry Land, California – When things beyond Carnival’s control happen to their ships, you would not believe what they have to go through to make the best of the situation while salvaging a vacation for their guests. Most of the time they get no thanks. This is on top of the daily complaints they get. (Check out John Heald’s blog for a look behind the scenes at life on board a cruise ship. Just from his 3 months on the Splendor alone John has had to respond to – and I am not making any of this up – a lady who complained that she saw a spider on a shore excursion in PV (Puerto Vallarta); a man who voluntarily participated in one of the shipboard shows, then verbally abused the staff and John demanding that the entire video of that show be taken down and not shown on the ship’s television; a man who demanded to have use of a lounge so he could give a lecture to passengers warning them that the world was going to end in 2012; a woman who berated the staff for paging her over the ship’s PA system one morning (her young kids had called security because she did not return to her cabin the night before. She answered the page from another guest’s cabin); the numerous people who complain that the food in the steakhouse was the worst they’ve ever tasted and demand a full refund…after, of course, they had eaten every bite and never said a word to the staff in the restaurant that they were unhappy with anything; a woman who yelled at the Camp Carnival staff because they allowed her son (whom she dropped off at Camp Carnival) to watch television. And on it goes). You’ve most likely faced a travel delay where a plane was diverted to another airport or even taken out of service due to a mechanical problem. You probably know that the airline has to scramble resources to handle a plane that is at a gate where it wasn’t supposed to be, or to find a gate when a plane is at an airport it wasn’t planned to land at. They have to hustle to make sure that all of the passengers’ luggage gets where it was tagged to go. Larger airlines may have a standby plane that can be pressed into service if need be. Cruise lines don’t have that option. They don’t have spare ocean liners sitting at a dock somewhere. On the other hand, cruise lines are like airlines when it comes to securing an alternate port. Last year when the Splendor diverted from her original schedule, Captain Giorgio Pagano had to make some quick decisions. If the weather doesn’t improve, is there another port within range that could be substituted? Can it accommodate a vessel as large as Splendor? Can the port accommodate 3,300 guests going ashore at the same time? Are there shore excursions available for the guests? Does the port have provisions to re-supply a ship of Splendor’s size? If the itinerary is changed, can Splendor get back to Long Beach by 8:00am Sunday? 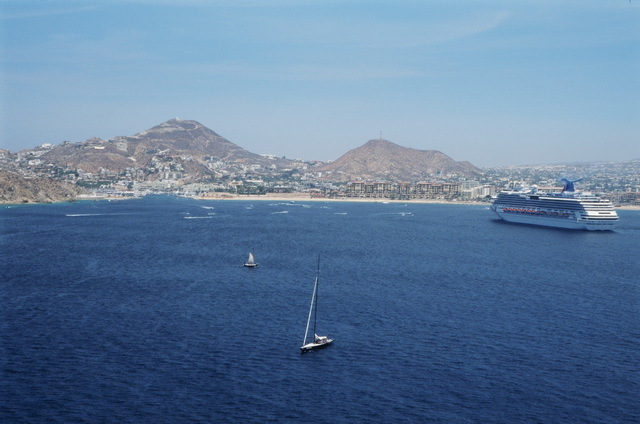 The decision was made and we sailed to Cabo and Mazatlan in reverse of the planned itinerary, and steamed hard up to Ensenada. Carnival could have easily said, “Sorry. Weather problems are preventing us from completing our schedule.” (By the way, in Ensendada we ended up at a small hole-in-the-wall place that served the best fish tacos we’ve ever tasted. Right across the lot was a shack that made the best churros we’ve ever tasted). It is fortunate that there were no injuries to the guests or crew. For the most part, passengers understand the situation and have made the best of it. Several reports have the guests praising the staff for how they handled the incident. Of course there are a few passengers who are disgruntled beyond appeasement. Those are probably the ones you’ll see being interviewed when the passengers finally get off the ship. Regular announcements apprising guests of the situation began at approximately 6.30 am (Monday). Guests were initially asked to move from their cabins to the ship’s upper open deck areas. At this time, guests have access to their cabins and are able to move about the ship. Bottled water and cold food items are being provided. A U.S. Navy aircraft carrier resupplied the cruise ship Tuesday evening. Sailors stood on the deck of the USS Ronald Reagan in 50-yard lines, handing off boxes of water, frozen bread, sandwich meats, granola bars, paper plates and more for the Splendor. So the guests do have more to eat than the Spam (Spam Musubi, anyone? ), crabmeat and Pop-Tarts® the media has led us to believe is all that is available. Carnival further announced that all drinks are free. They are warm drinks but at least guests would not have to pay for them. Guests on the current voyage will be receiving a full refund along with reimbursement for transportation costs. Additionally, they will receive a complimentary future cruise equal to the amount paid for this voyage. 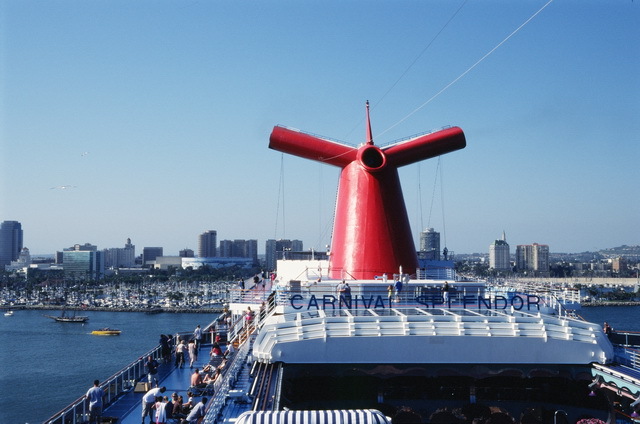 Carnival has also cancelled the Nov. 14 seven-day cruise from Long Beach. Guests scheduled to sail on this voyage will receive a full refund of their cruise fare and air transportation costs, along with a 25 percent discount on a future cruise. Splendor is 952 feet long. She weighs in at over 113,000 tons. This massive floating hotel is transporting one shy of 3,300 guests with a crew compliment of 1,167 on this sailing. This is what the tugs are contending with…slowly. Splendor is being towed back the US – San Diego to be exact – at the breath-taking speed of 4 knots. She is capable is cruising at 21 knots. To get an idea of the difference in speed, imagine you are driving from LA to Albuquerque, New Mexico. Before you reach Kingman, Arizona, a fan belt breaks. You and you car now have to continue the trip being towed by someone riding a mountain bike (must be a very strong person) at 12 miles per hour, with no air conditioning in the car. A large Carnival team continues to work on hotel, flight and transportation arrangements for the guests and will be on the ground in San Diego when the ship arrives. Carnival says they have over 100 people dedicated to that effort. By the time you read this post, the crippled Splendor will have made it to San Diego and safely docked. The passengers will have happily disembarked, no doubt thankful to be back on dry land with real food and functioning toilets. The engineers and crew of the Splendor will have begun the tedious task of repairing her. All things considered, it’s a good thing Splendor is on a Mexican Riviera itinerary that keeps her relatively close to shore. Imagine if this had happened mid-way through a trans-Atlantic voyage. Writers note: If any guests who were on board Splendor’s ill-fated trip are reading this and do not want to use their complimentary free cruise voucher, I am shamelessly suggesting you donate it to this very appreciative writer. Update – November 15, 2010: John Heald, Carnival’s senior cruise director, is able to post updates to his blog again. He has posted a candid report of his (and Splendor’s) experience which he called “Smoke on the Water”. Here are Part 4, Part 5 , and The Final Chapter. 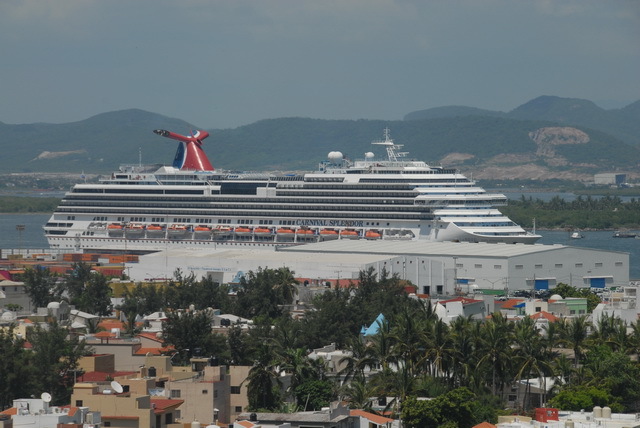 Let me say right off the bat that I was not aboard the Carnival Splendor when she experienced an engine fire that left her dead in the water on Monday. But I was on that ship three months ago. This past August marked my second voyage on Carnival’s 2-year-old cruise ship Splendor. And since I’ve sailed on Splendor twice now, I feel a certain amount of attachment towards her. (On this last trip I was very upset to see where some knucklehead had scratched “F***” into the door of one of the ship’s elevators.I felt like they had done that to my house). I was blessed that we were able to make it to all of our scheduled ports with no detours. Out of six cruises, I’ve been diverted four times. So I can empathize a little bit with passengers on those trips when something forces the ship to change plans. Her Mexican Riviera itinerary has Splendor departing from Long Beach Sunday afternoon and arriving in Puerto Vallarta on Wednesday morning, cruising for two days to get there. Leaving PV, she calls on Mazatlan on Thursday, and then over to Cabo San Lucas on Friday. The return home takes a little over a day and a half. I truly enjoy cruising. But after the second day at sea, my camera and I start to get antsy. Not that there aren’t a ton of things to do on board. There are. Between all the meals and shows and food and movies and food and contests and food and classes and… there is something to keep you occupied from the time you wake up until the wee hours of the morning. It’s just that my Nikon and I are ready to get off the ship and see more than the 13-deck ocean liner we’ve been sailing on for the last two days. Don’t get me wrong; I thank God I am able to take cruises like this, and Splendor really is a magnificent ship. 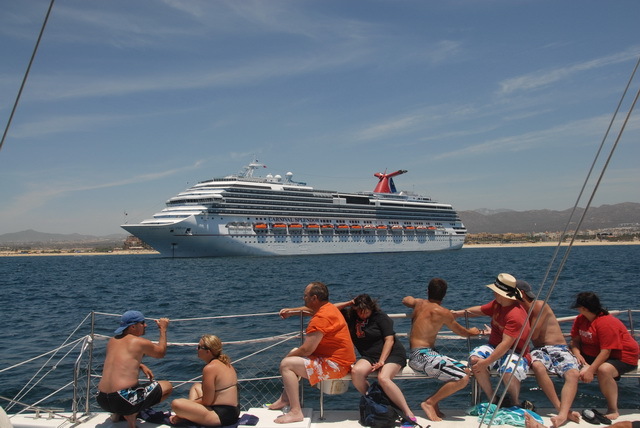 My first cruise was a weekender to Ensenada, Baja California. This was way back in 1984. High winds damaged the only tug boat they had in the harbor so our ship, the Azure Seas, could not be brought to the dock. Needless to say we could not get off the ship. I was disappointed because the day before we left, a well-traveled businessman had given me a list of restaurants he recommended. And I absolutely had to visit Hussong’s. As a consolation, the captain announced that drinks would be on the ship, er, on the house for that day. What did the ship do instead of anchoring off a port we couldn’t go in to? We sailed back toward San Pedro, slowly zig-zagging our way up the coast. Churning somewhere nearby in the Atlantic during a very active 1995 hurricane season, Hurricane Opal disrupted my third cruise. Carnival Festivale was supposed to call on St. Thomas and four other southern Caribbean islands. Almost the entire schedule was changed. Instead of St. Thomas, we stopped at St. Croix. Because of the storm, power was out on the island but we made port there anyway. I guess because of the power outage, store owners had some down time and we were able to enjoy some nice conversation with a few idle Crucians. Instead of St. Maarten, we docked in St. Lucia. Ah, St. Lucia. Another island I’d like to spend more time on. Soufriere. The Pitons. But I digress. When I sailed on the Splendor last year, we were racing a storm that was powerful enough to warrant a detour; we lost PV and were instead given Ensenada. Initially I was upset; I had been to Ensenada already (yes, the Azure Seas made it there on my ’86 trip) so I was in a been-there-done-that frame of mind. I hadn’t been to PV before nor had I been that far south in Mexico. But I did understand that on the seas you are at the mercy of the seas. Sometimes the weather is fair, sometimes it rains. Red sky in morning, sailors take warning. Carnival calls themselves the “Fun Ships”. Obviously not many people are having fun now. You have heard the reports; engine room fire takes the engines out, stuck in foreign waters, no power, no elevators, no hot water, no refrigeration, no air conditioning, no hot food, and, until recently, no flushing toilets. Some people freak out when power goes out in their own homes for a couple of hours. Can you imagine what it must be like to be cooped up in a house without power or hot water or refrigeration with 3,000 of your (now very close) friends? Oh, and since Splendor has no power other than emergency power, she can’t control her stabilizers, which help minimize the ship’s rolling motion at sea. So a lot of passengers are getting seasick. There are reports (erroneous, it turns out) of numerous barf bags in the corridors. Which, obviously, smell. And don’t forget; the crew is facing the same conditions as the guests. Only most of them have smaller cabins than the guests. Let’s break it down a bit more: You save for a year or more to take this cruise. You get your vacation time approved by the boss. If you are travelling with family and/or friends, you finally find a time when all of you can make the trip. And, you may be celebrating a special event like a honeymoon or a birthday. Now you make travel arrangements to get to Long Beach, which may include air and/or car and/or hotel. The stars have aligned and you arrive on board to begin your highly anticipated, fun-filled seven-day excursion. Fourteen hours into your voyage, a fire breaks out in the engine room and, just like the Splendor itself, your vacation comes to a halt. What do you do? If you are like most of us, you can’t re-do this trip again as soon as Splendor is repaired. You might have to wait a year or more – if you can ever make this trip again at all. Your whole week is lost. Your whole vacation, at least the shipboard part, is ruined. You won’t have another 25th anniversary or 50th birthday. This special time is something you can’t get back. Update – November 15, 2010: John Heald, Carnival’s senior cruise director, is able to post updates to his blog again. He has posted a candid report of his (and Splendor’s) experience which he called “Smoke on the Water”. Here are Part 1, Part 2, and Part 3.